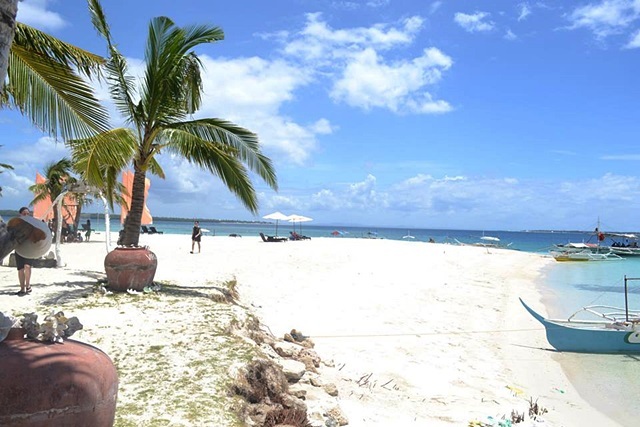 You are here: Home / Beaches / Virgin Island in Bantayan: Make it Your Next Cebu Summer Destination! Bantayan Island in Northern Cebu is famous for its powdery white sand beaches and delectable seafood. It is also the gateway to smaller islands which are perfect for quick getaways and your summer trips, ideal even for your team building activities. One of these islets that you can escape to is “Virgin Island”. If you want a luxurious taste of island life without having to spend thousands of money, plan a trip to Virgin Island. This island boasts of white sands, crystal clear blue waters and amazing scenery. Virgin Island is part of the township of Sta. Fe, Bantayan but you need to charter a pump boat in order to get there. The pump boat fare costs 150 pesos per person and it takes up to 30 minutes to reach it if you are starting from the town proper. Alternative route that you can take is by hiring a tricycle to take you to Brgy. Sillon and then take a pump boat ride from there. If you choose Brgy. Sillon as your starting point then your boat ride will be a lot shorter. Virgin Island also has a restaurant where you can order popular food items such as calamares, sinugbang isda or any grilled viands. Grilled Seafood is a big hit among tourists and locals alike so don’t miss it. Just ask their accommodating and friendly attendants for assistance. There is also a souvenir stall where you can buy T-shirts as pasalubong items as well as little trinkets like ref magnets and keychains. For the sporty ones, make use of the vast area in the island and work up a sweat with a game of beach volleyball. Or you can gather your friends and ask someone to take a picture as you all engage in a mandatory jump shot pose. If you love taking pictures then Virgin Island’s unique loveseats will surely be a delight. These seats may have been handcrafted using the simplest materials but its design and accessories give it an astounding island vibe.